Place cauliflower crumbles, eggs, flour, baking powder, salt, pepper, onion powder and garlic powder into a bowl and whisk until combined. Fold in cheddar cheese. Heat a Belgian waffle maker to medium heat. Coat with cooking spray. Scoop ½ cup batter and spread on the bottom of the waffle maker. Close lid and cook 4-6 minutes, until waffle is browned and cooked through. Remove and repeat with remaining batter, coating with cooking spray between each waffle. In the meantime, coat a medium frying pan with cooking spray and heat to medium. Crack 4 large eggs into the pan once it's hot and season with salt, black pepper and red pepper flakes. Allow to cook for a few seconds, then turn heat down to medium-low. Allow to cook until egg white is almost set, then put a lid on the pan and turn to low. Cook just until top of the white is set, but yolk is completely uncooked. 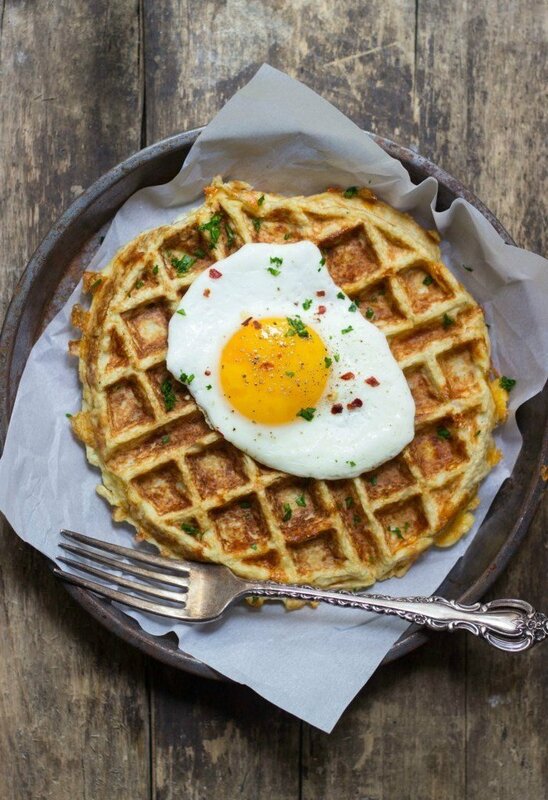 Top waffles with fried eggs and parsley, green onion or chives.